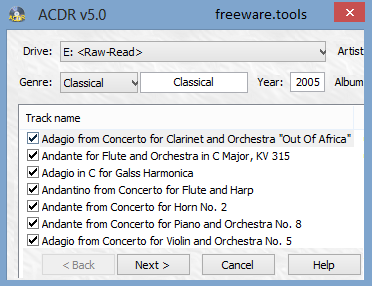 ACDR is an audio application whose purpose is to help you read and rip audio tracks from CDs, DVDs and BDs, retrieve online information about songs using the freedb service, and normalize volumes using the ReplayGain support. Extract tracks from audio CDs and save files to WAV, AAC, AIFF, APE, FLAC, M4A, MP3 or other file format, normalize the volume, cut the leading silence, and create M3U playlists. Simply stated, ACDR is a reliable and fully featured tool for reading audio tracks from audio CD's (a.k.a. "ripping"). It's extremely easy to use tool that will satisfy every user. ACDR is an audio application whose purpose is to help you read and rip audio tracks from CDs, DVDs and BDs, retrieve online information about songs using the freedb service, and normalize volumes using the ReplayGain support. The utility adopts clean looks and accommodates a set of intuitive features. There’s also support for a help manual in case you want to find out more about the program’s capabilities. ACDR employs a wizard-like assistant for helping you rip audio tracks. This particular approach is suitable for less experienced users, as they are offered guidance throughout the entire configuration process. The application automatically reads and displays the audio tracks from the selected drive. In addition, you may modify the information about the genre, year, artist and album, as well as rename audio files. You can refresh the items displayed in the main window with a single click, view information about each one (track name, start time, length, and size), and play tracks using the integrated audio player. The player embeds only basic controls used for starting or pausing the playback and seeking a position in the audio streams. The tool lets you easily select the audio files that you want to rip, get song information from freedb (e.g. track, album, and artist names), and eject the disc. ACDR helps you select the saving directory, set up file naming rules, write consecutive tracks into a single file, overwrite existing files without prompting, and create M3U playlist. What’s more, you can choose the output file format from various options, such as WAV, AAC, AIFF, APE, FLAC, M4A, MP3, OGG, SHN, and WMA, resample all waveforms to a certain sample rate, normalize the volume, remove leading silence, and cut off track after a custom number of seconds and fade out at cut point. Tests have shown that ACDR carries out the ripping task pretty quickly and without errors. It doesn’t eat up a lot of CPU and memory, so the overall performance of the system is not hampered. You can make the application eject the disc and exit the program at the end of the task.